We’re looking for you! With the help of our good friends at WFMT, Chicago’s public radio station, we’re launching an exciting new Junior Great Books® alumni outreach initiative. Starting today, August 15—and the following three weeks—WFMT will air 60-second messages inviting former Junior Great Books participants to tell us their stories. People are encouraged to share their memories on our alumni web page. 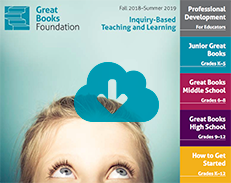 We love hearing from program alums and our goal is to use their experiences to inform educators about the power of Shared Inquiry™ & Great Books programs. Alliance for Liberal Learning Fall Conference →← EdScoop Features Great Books Plus!